TALLAHASSEE, Fla. - Had Mark DeFriest just waited a couple of months to collect his inheritance, he never would have gone to prison. Had he just behaved while he was there, he would have been released more than 30 years ago. But the man dubbed Florida's "prison Houdini" kept escaping instead of simply serving out a sentence for stealing the very mechanic tools his father left him in a will. His original four-year-sentence almost turned into a life sentence - until this week. 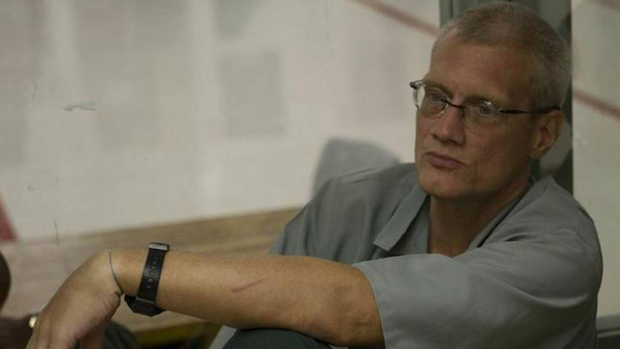 Giving DeFriest, 54, a chance to be free after 35 years in prison, Florida's parole commission voted Wednesday to move up his release date to March 2015 from 2085, when DeFriest would have been 124 years old. A documentary filmmaker calls it a case of a man who got trapped in a prison system that can't handle people with mental health issues and said he hopes DeFriest's example will inspire change. His lawyer calls the case a family matter that got out of hand. "I don't think there was a crime committed," said DeFriest's attorney, John Middleton. After DeFriest's father died, the 19-year-old didn't wait for the will to be read before collecting the mechanic tools, using a key to get them from his father's shed, Middleton said. His stepmother reported him to the police, and when they questioned him, he ran. It didn't help that he had a gun, though he never pulled it. Things snowballed from there and during his first escape he climbed over razor wire and ran. In all, he had seven successful escapes in 13 attempts. He was also charged with stealing a car at gunpoint and breaking into a friend's home after one escape. Each offense added more time to his sentence, and behavior problems gave the parole commission no reason to move up his release date. He has nearly 400 disciplinary reports on file, including 65 from 1983 alone. Middleton said that in one incident, DeFriest duplicated the master key at Florida State Prison, the toughest in the state's system, and let out fellow inmates to roam around. Filmmaker Gabriel London, who has made a documentary called "The Life and Mind of Mark DeFriest," argues that DeFriest's troubles stem from his mental health issues. London and Middleton believe DeFriest has autism, but also functions at a high level. They call him a genius and a savant. "He has a meticulous, disciplined, incredibly skilled mechanical mind that can pick up anything," London said. After glancing at keys dangling from guards' belts, London said DeFriest was able to memorize the patterns and fabricate his own key. But he also uses his skills to create intricate art out of materials like paper chip bag foil and Popsicle sticks. After a 1981 escape, Bay County prison authorities placed DeFriest in total darkness with no clothes, no blankets, no toilet paper and no human contact for 11 days. Middleton said DeFriest has been assaulted several times in prisons and at one point spent years without being allowed yard time. That's why he kept trying to escape - not because he wasn't willing to complete his sentence, the lawyer said. DeFriest has been kept in out-of-state prisons for his own protection since 1999 after witnessing guards beat another prisoner to death. State prison officials won't disclose where he is and did not immediately comment on DeFriest's case. While DeFriest still has time to serve for prison offenses in Alabama and California, Middleton is working to have the remaining sentences reduced or dropped. In a best case scenario, DeFriest will be free sometime next year. At worst, sometime in 2018, he said. DeFriest's wife, Bonnie, married him while he was serving his sentence. She is lining up work for him using his mechanical skills. Middleton is confident he will succeed outside of prison. "Mark is not going to go out there and rob stores," he said. "This man is not stupid. He's extremely intelligent, and very talented." After the hearing London called Bonnie DeFriest to tell her the news. "Mark's gonna get out of prison," London said.